1830 - The Township of Kelmscott was gazetted and declared to be at latitude 32 degrees 7'S and longitude 116 degrees 2'E. Initially the townsite served as a military outpost to protect the early settlers and explorers. The Canning River locality provided the early Settlers with fertile soils and a vital water supply. 1851 - Work commenced on the Perth to Kelmscott Road. 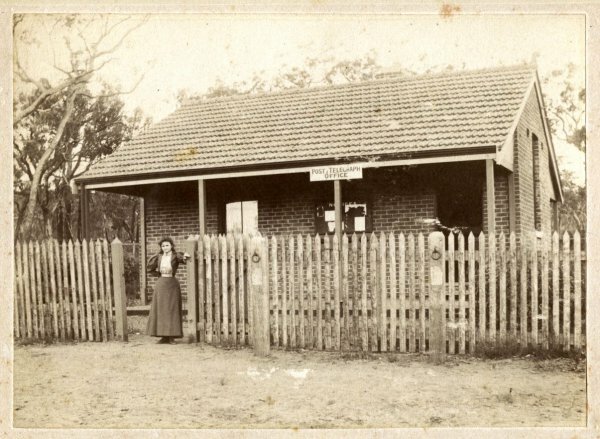 1853 - The original Narrogin Inn established at the corner of Albany Highway and South West Highway for travellers venturing southwards towards Albany. This establishment signalled the beginnings of the township of Armadale. 1855 - First policeman in Kelmscott - Constable Cronin. 1866 - The first saw mill was built by Thomas Buckingham at Roleystone. 1871 - Road District Boards were formed by the Government. 1871 - St Mary's Church in Kelmscott was built. 1880s - Timber had become an important industry in Kelmscott and Roleystone with the milling of jarrah ('West Australian Mahogany'), Red Gum and Sheoak. This timber was used to construct railway sleepers, the first bridge over the Swan River, the Rockingham Jetty, the Bunbury telegraph line, and bridges over the Canning River in Kelmscott. 1889 - Railway line from Perth to Armadale was completed and Armadale mushroomed into a vital and prosperous settlement with houses, roads and shops clustering around the station. Settlers were now able to send all their produce more quickly to Perth by rail. This included eggs, fruit, vegetables, dairy produce, milk, livestock, timber and bricks. The routing of the railway line through Armadale was an important step in the town's history. 1891 - The first Kelmscott Hall was built. 1894 - The Kelmscott Road Board was created, first recorded minutes are from a meeting 5 April 1895. 1895 - Bedfordale Hall opened, corner Admiral Road and Albany Road. 1897 - First civic hall was built in Armadale: the Mechanics Institute Hall. 1897 - First Kelmscott Agricultural Show held. 1898 - Opening of the Post and Telegraph Office in Jull Street, Armadale.